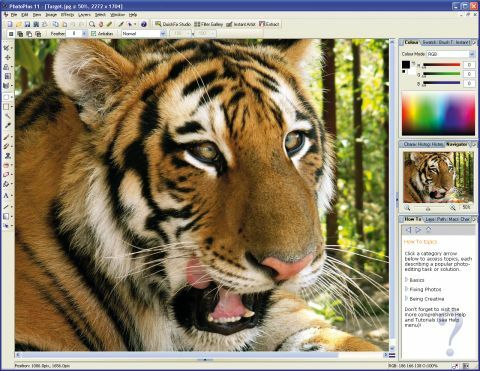 PhotoPlus is a very capable editor that's never quite escaped the shadow of Paint Shop Pro. Will version 11 be any different from its predecessors? Certainly not with regard to the interface: it's more cluttered, and not as straightforward for beginners. Features, then? PhotoPlus 11 includes a new QuickFix Studio to solve brightness, contrast and colour problems. It doesn't address as many issues as Paint Shop Pro, though, or have the same automatic fixes. The program puts up a better fight with filters (there are no less than 11 blur types, impressive lighting effects and an attractive mosaic-like paper tile filter), but again Paint Shop Pro has better effects overall, and makes them easier to access. PhotoPlus does win out in photo management, arranging your images into albums, and making it easier to search for, view, print, or back them up. But with these features readily available for free, it's hard to justify paying extra to get them in PhotoPlus 11.